How many requests for "scary" books do middle school librarians get in one day? Sure, we have some really good ones--Coraline, The Graveyard Book, Doll Bones, Goosebumps--but do you ever have enough of them? Do some of your students come back and ask for something scarier? Of course they do. 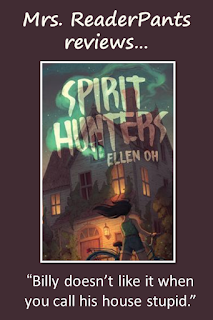 I loved scary books as a middle schooler, and while Spirit Hunters doesn't provide the blood and gore some students are after, it will surely give them that "shivers up the spine" factor we love so much. I thoroughly enjoyed this book look forward to booktalking it with my students this fall. SUMMARY: When her family moves to a creepy old house in Washington, DC, twelve-year old Harper's little brother Michael starts talking to someone named Billy. Before long, Michael begins acting strangely, and accidents and weird events start happening. Harper knows Michael needs her help, but what can she do? Could Michael really be possessed, or is Harper just imagining things again? Twelve-year old Harper has moved from New York to Washington, DC with her parents, teenage sister, and four-year old brother, Michael. As Harper unpacks her new bedroom, her little brother calls her to his room. Michael's room is unnaturally cold, and Harper shivers as she goes in. Michael introduces Harper to his new best friend, Billy, who Harper cannot see. Michael tells Harper that Billy lived in the house before Harper and her family. Harper tells Michael not to tell their parents about Billy, saying that their mom wouldn't understand. Michael tells Harper that "Billy said not to go in the attic." On her way out of the room, Harper calls their new house "stupid," and Michael says "Billy doesn't like it when you call his house stupid." Looking for more scary books for teens and tweens?